You can save selected groups of notes that you frequently use. The game can then be configured with those notes from a single tap. 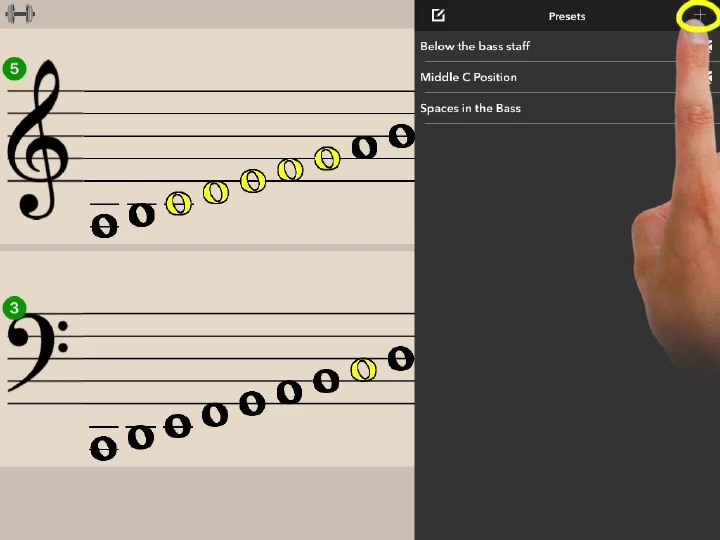 Manually select all of the notes you wish to be included in this specific preset drill. Tap the + icon to add a new preset. Give the preset a name. Tap this preset whenever you need to reconfigure Flashnote Derby with these notes. Remember Choose the notes you want in this drill before trying to create the preset. Be careful- Sometimes there are selected notes which are off-screen and thus not visible. When you create a new preset from scratch, you might wish to use the instructions for clearing all the notes in each staff to make sure you are starting with a clean slate.